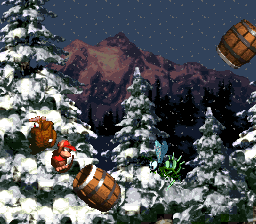 Snow Barrel Blast is the seventeenth level of Donkey Kong Country, and the first level of Gorilla Glacier. 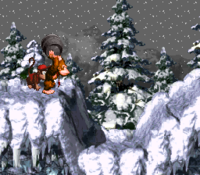 The level takes place on snowcapped mountain peak, where the Kongs must trudge on icy ground and go up and down steep slopes. 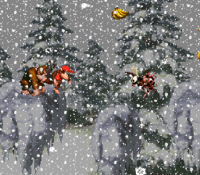 This stage features transitional weather: the snow slowly becomes heavier as Donkey Kong and Diddy Kong go through the first half of the stage: Snow Barrel Blast starts with clear, blue sky, then light snow, then the skies become gray, the snow becomes heavier, until finally becoming a blizzard by the Star Barrel. Neckys and Zingers are the main enemies of the level. To add to the challenge, the Kongs must cross large abysses by blasting between Barrel Cannons, much like Barrel Cannon Canyon. Neckys and Zingers appear as obstacles in these segments, which has both Barrel Cannons that spin around rapidly and ones moving up and down in a fixed vertical position. Donkey Kong and Diddy can optionally skip the whole segment by blasting blast down from the third Barrel Cannon, which leads them through a trail of Auto-Fire Barrels to the last portion with the level exit. The Game Boy Advance remake features a shorter transitional effect of the snowstorm, contrary to the jungle levels' daytime transition effect being absent. The Game Boy Color release features a clear, dark blue sky throughout the entire stage. At the start of the level, the heroes emerge from an igloo near a small hill with a Necky slowly flying over it. They can find a Barrel Cannon at the top of the slippery slope. If they aim and shoot towards a banana trail, they land on a flat piece of land. As the Kongs approach a small alcove in the ground, a trio of Neckies fly by that can be bounced off of to reach an Extra Life Balloon. Two Klaptraps march along a flat surface below these bird enemies. If they continue ahead, they can find a piece of ice floating in an abyss. A Zinger orbits this platform. A downwards slope can be found nearby with a Barrel Cannon at the bottom of it. Although a trail of bananas is placed straight above it, the heroes must shoot diagonally with it to cross a gap and land back on land. A Zinger stands in their way as they shoot across. Upon landing back in solid ground, a Necky flies towards the Kongs. A steep ledge and a snowy hill are ahead, and Klaptraps walk along them. The letter K is just before a Barrel Cannon at the bottom of the hill. This helpful barrel can be used to send them over an abyss. However, it cannot shoot them all the way across, but there are two other Barrel Cannons in the gap assure that they get over. They are placed diagonally from each other. Donkey Kong holds a steel keg. Once the third barrel shoots the primates back into land, Donkey and Diddy head up a small hill with a few Klaptraps at the top of it. After the heroes tread over this flat pathway, they reach a Barrel Cannon that aids them in crossing another gap. A Zinger surrounds it. Three other Barrel Cannons are placed over the abyss diagonally from each other. The Kongs must use them to blast of the gap, which has a steep hill on the other side of it. A steel keg stands on the top of this hill, which is followed by another steep hill with several Gnawties crawling along it. A Necky and another gap are at the bottom of the slope. An Auto Fire Barrel also floats at the beginning of the gap that blasts the primates to another Auto Fire Barrel above it. This barrel then shoots them towards a Necky above solid ground. Once the Kongs land back on the ground, they can find a long, steep, and slippery slope ahead of them that leads to a Barrel Cannon in a gap. The cannon can blast them to an Auto Fire Barrel. This barrel then shoots them towards two more Auto Fire Barrels, which fire them a long distance over a large section of land. The heroes land on the Star Barrel, which is located to the right of a lone Krusha. A flat pathway with a ledge at the end of it is ahead. At the top of the ledge, the heroes can find a small hill with a wall in front of it. They can blast over the wall with a nearby Barrel Cannon, which rotates at a full 360 degree turn. If they shoot at the correct angle, they are blasted directly onto a raised piece of land with a DK Barrel on it. A slippery hill is to the east of here with a large gap at the end of it. The primates must cross the beginning of the abyss with the use of a few small platforms floating in it. Neckies fly towards them as they progress, but they disappear when the Kongs reach an Auto Fire Barrel. This barrel shoots them over more of the gap to a normal Barrel Cannon with a Zinger around it. The cannon can be used to continue over the gap through the letter N and to an Auto Fire Barrel, which then blasts them over the remaining part of the gap. A storm hits as the Kongs near the end of the level. When they reach land again, they can find a flat pathway with a Barrel Cannon above it. An Animal Token of Rambi hovers above it, while a pair of Zingers surround the barrel. Nearby, the heroes can find a Necky flying in a wide abyss. Many Barrel Cannons are lined up next to it over various parts of this gap. The Kongs must shoot through the barrels to cross. As they progress, many Zingers impend in their progress. Some of the foes fly in a vertical path between the barrels, while others surround them. Eventually, the heroes find themselves in the final barrel, which can fire them onto a small, icy platform with a sign on it; the sign informs them that they are near the end of the level. Several more small platforms are ahead, one of which that has a Zinger surrounding it. After the final platform, the primates land on a larger piece of solid ground with a large hill on it. As they climb over the hill, a Klaptrap attacks them. On the other side of the mound, they can find two steep ledges with an exit sign at the top of it. If they walk into the igloo near here, they complete the level, heading over to Slipslide Ride. Rambi Token Right after the letter N, between two Zingers. It can be reached by using a Barrel Cannon. The letter O is at the top-center of the second Bonus Area. The Kongs can blast to it from using a Barrel Cannon. After the Star Barrel, the Kongs must pass a group of Neckys. The letter N is located directly above the third Bonus Area, and can only be obtained by directly blasting from a Barrel Cannon. There are two letter G's, based on the path the Kongs choose. The first one is automatically obtained while blasting through the shortcut chain of Auto-Fire Barrels, while the second one is near the end of the final barrel blasting segment. Stop the Barrel! At the very start of the level, the Kongs must jump onto the entry igloo and wait for a flying Necky to come close to them. Once it gets close, the Kongs must bounce on the Necky and head left into the Bonus Barrel. The objective is the same as most other challenges of its type: the Kongs must observe an Animal Token (more specifically, Winky) as it moves through four barrels before suddenly in one and vanishing. The Kongs must jump at the correct barrel that the Winky Token stopped in to be rewarded with it. Collect the Prizes! When Donkey Kong and Diddy reach the Star Barrel, they must go left and jump into a nearby pit, just before the level's Krusha. The location of the Bonus Barrel is indicated from a trail of three Bananas. In this Bonus Area, the Kongs can collect a variety of Bananas and the letter O by blasting out of a rapidly-spinning Barrel Cannon. The Kongs can exit the challenge by falling down the pit from missing the Barrel Cannon. Find the Exit! In a barrel, just before the letter N and after a group of Neckies after the Star Barrel, the Kongs must blast down onto a hidden ice platform. They must jump into the Bonus Barrel located on the third platform. In this Bonus Area, the Kongs can blast between a straight alignment of spinning Barrel Cannons and collect Bananas along the way. They can exit the level at the other side, or by falling down the pit. The Kongs begin the level. Donkey Kong jumps towards the letter "K". Strangely enough, much of the music in the Cliff world of Donkey Kong Country Returns is a remix of Northern Hemispheres, despite the fact that there are no icy levels in the game at all. Coincidentally, the Cliff is located in roughly the same spot as Gorilla Glacier. The Steel Keg makes unusual sounds because of a sound font issue also affecting Dumb Drum's crash sound and the sound that plays for the elevator in Tanked Up Trouble when a light on the fuel indicator turns off. In the Japanese version of the game, there were two DK Barrels added to the Barrel Cannon section, while one of the existing ones was moved. Additionally, the first Klaptrap in the level was completely cut from the game, as were one of the Neckies and the green Zinger before the Barrel Cannon. The Spanish translation of this level is shared with Button Barrel Blast in Donkey Kong Land. ↑ @Ghoulyboy (11:09, September 12, 2015). Last bunch of #DKCrevealed levels before I move onto some unused stuff. It's a Barrels, Ice and Temple combo. Twitter. Retrieved July 24, 2018. This page was last edited on April 5, 2019, at 12:27.